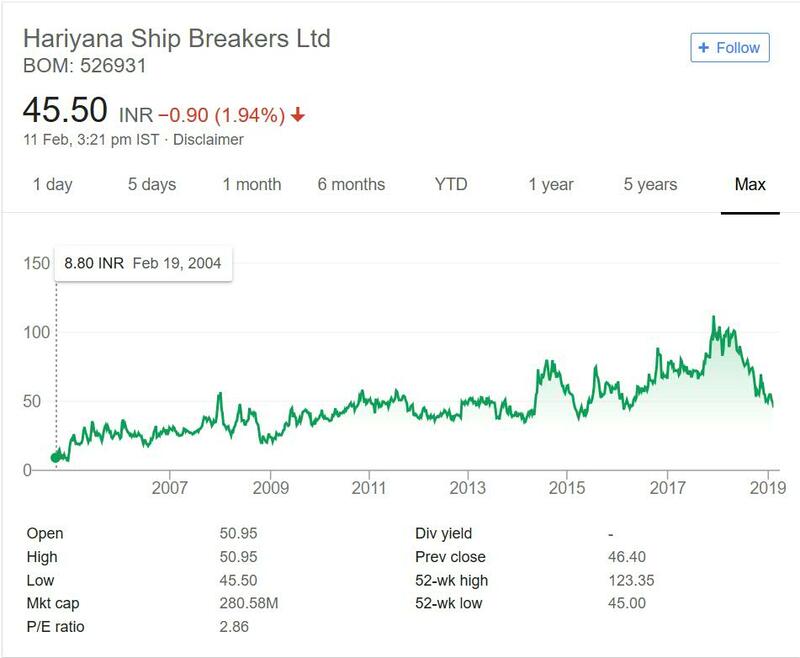 Hariyana Ship Breakers Ltd. is in portfolio of Subramanian P. He is one of the top investors in India. It is a Recycling Company. To be precise it is Ship Recycling Company. It is the only company listed in this niche on Stock Exchanges. As per the Company website it is based in Alang Asia’s largest and World’s major ship recycling yard. Along with Ship recycling it is also engaged in Ship Recycling, Steel Manufacturing, Steel Trading and Real Estate Development. Ship recycling is challenging business. Company claims to be green ship recycling. It is major business of the group along with minor presence in other verticals. The Company got listed in year 2004 at close to 9 INR. It never went below the issue price. This is good sign of listing and Company performance post listing. It has moved up slowly with price fluctuating with every rise and fall. If you take current price and 2004 price into account Company has given 6 times returns to Investors in these 14 years. Note at one point is also traded above 100 mark but we are not considering. I assume person has bought on listing date and hold on to the stock till date. The company has unique business to say the least. It is the only listed player as per the Company website dealing with Green Ship Recycling. It is one of the most dangerous and labor intensive industry. So it is tough for companies to enter this business easily. Above factors make this Company in a type of monopoly position. With growing importance of Environmental friendly breaking of a Ship Company will have added advantage. Note major competitors are from China, Pakistan and Bangladesh. These two neighbor countries along with India have major share in Ship breaking industry. India being the only one out of Pakistan and Bangladesh which can provide environment friendly services. This advantage will help the Companies in this segment. I will track this Company to know more about the business performance over the years and future.In case you are interested then you can track the company by adding it to your stock watch list. That way you can keep close eye on the Company.